MartianCraft is a remote company. We have no physical offices, and our team members work from home, coffee shops, co-working spaces, libraries, and beaches full time. Since we are a consulting company, there are many challenges of running a successful remote consulting team — none of which are more formidable than finding the right type of person to fill a remote position. Whenever I tell someone about working remotely people remark how great it must be. Everyone fantasizes about working from home: sitting on the couch in your pajamas eating cocoa puffs and knocking out conference calls and reports. While everyone thinks they want the perk of being remote, it is often a trap waiting to be sprung. I have seen people leave MartianCraft because “remote just isn’t a good fit”, where a few months before they were head over heels about being able to work from anywhere. It is easy to visualize all the great aspects of remote, while ignoring the the very real psychological implications. How does someone know if they are well suited for a remote position if everyone thinks remote is for them? The best answer I can provide comes from years of refining our interviewing and hiring procedures. We ask several questions about working remotely when screening new applicants. The most important of which is “What do you feel is the most important trait to working well remotely?”. Almost everyone will answer with some form of being a good communicator. Yes, communication is important for any employee, slightly more for remote employees. However, I feel that significantly more important is routine. I’ve watched hundreds of remote workers for years, the most telling sign of who will do well, and who will flounder, is maintaining a disciplined routine. It is amazingly easy to sleep in, watch some TV in the morning, do chores, run to the food store when its quiet, take the dog out, and so on. When working remotely it is all too easy to let your day slip away 10 minutes at a time. Simple tasks like checking the mail, putting laundry in the machine, cleaning dishes, or vacuuming may not seem like they are pulling you away from work for too long. The reality is you will be easily distracted by these tasks when they are right in front of you all day, and they almost certainly take more time to complete than you realize. A work from home job needs to simulate the mentality of a traditional office job. Waking up, sitting down at your desk, going to lunch, taking the dog out, going to the gym all on a schedule is crucial for success. When you set timetables for yourself you will become less distracted and more productive. The biggest threat to working from home is being distracted by your home. A successful remote employee will be able to mentally separate their home into an office and a living space. A home office helps tremendously with this, but there is more to it than that. You will need to get into the habit of thinking of your office as a separate place that you go and when you want to return home for lunch or a break its just a very short commute. It is possible to split workers into two distinct groups. The first are those who use a workplace to bolster their social life. They make friends with coworkers, they get together outside of work, they grab drinks after a long day, they are looking to increase the size of their social circle. The second are those who have established social lives, they have some long time friends, maybe they are married possibly with children, or they are introverts and become exhausted being social. The first group fairs less well working remotely, they will miss the interoffice interactions that they may not even realize they need. This isn’t to say a remote office cannot be a social or friendly place. However, and not due to lack of trying, there is no way to simulate the lets all grab a beer after work mentality. When your co-workers are scattered across the globe its hard to become very close friends with them. The second group on the other hand excels, they enjoy not being distracted by countless mandatory work obligations like parties, BBQs, promotion and departure celebrations, and after work gatherings. They enjoy being able to see their family or friends at 5pm sharp everyday. Finally we look for employees who are solid self starters. It is much harder to walk around the office floor as a manager checking in on people when everyone is in their own homes, or wherever they have chosen to work. A good deal of the workforce needs to be constantly pressured to work. These are the same people who waited until the night before a paper was due in college before starting it. 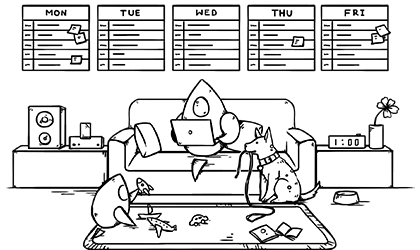 Remote work is a dream life for the lazy, they can get by with the bare minimum work and perhaps never be noticed. A good remote team member is one who is excited about what the work entails, they love to solve problems, and they never give up when something gets tough. These are the type of people who often lose track of time when working instead of watching the clock. This type of dedicated, impassioned, and talented worker can be hard to find. The good news is that when hiring remotely you are able to look at a much larger pool of people with a much smaller amount of hiring competition. The great news is that talented people like working with other talented people, it is the self fulfilling prophecy of remote hiring. Build a good routine that separates work from home. For example, wake up at 8am, in office by 9am, lunch at 12pm, walk dog at 12:30pm, cook dinner at 5pm, finish work at 6:30pm. A loose schedule like this can help structure your day and keep you distraction free. Maintain a good social and activities circle that is independent of work. There are endless approaches to building a social network but you can’t be reliant on a work based one. Be an excellent self starter who is motivated to accomplish the tasks in front of you. Personally I find a todo list with groups for items I need to complete each day as well as longer term tasks is fantastic, above and beyond that just enjoying your job and type of work is important. Working remote is tricky, there are factors to look at which are much more important than someone’s work experience and portfolio. Even past remote work experience isn’t a good indicator of success. Remote work inherently attracts the lazy and the unenthusiastic. However remote work also attracts some of the smartest, motivated, and passionate people on the planet. With a virtually unlimited hiring pool and little competition for talent, you will be able to grow an amazing team of professionals once you find the ones who will excel working remotely.